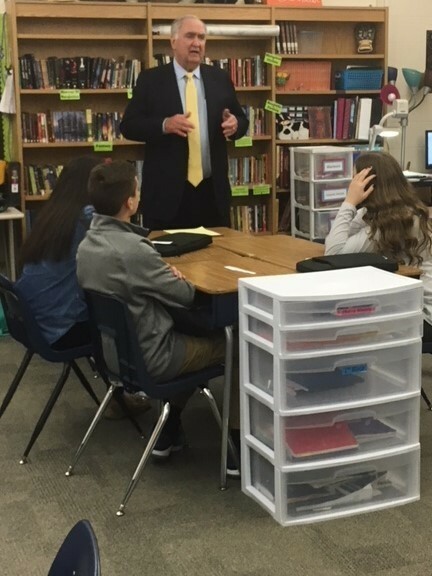 On Monday, April 14th, Mr. Steve Skelton, an attorney from Bloomington, came to Mrs. Hembra's Mock Trial elective to speak with seventh grade students about what it's like to be a lawyer. Mr. Skelton told students about why he decided to become a lawyer, the amount of schooling involved, and the qualities it takes to be an effective attorney. He also discussed the process of preparing for a trial, as students are currently preparing to create and participate in a mock trial of their very own. Thank you, Mr. Skelton, for taking the time to talk with our students!